Henry Darger is one of the most widely admired "outsider" artists to be "discovered" in the last 30 years, and one of the few to reach a broad audience beyond the limited circle of folk-art devotees. He has been widely exhibited not only at specialized institutions such as New York's American Folk Art Museum (which houses a study center devoted to his work), but also at mainstream contemporary museums such as PS 1 in Long Island City. The Musée de l'Art Brut in Lausanne Switzerland has a large collection of Darger's work on permanent view, and he is widely admired throughout Europe. 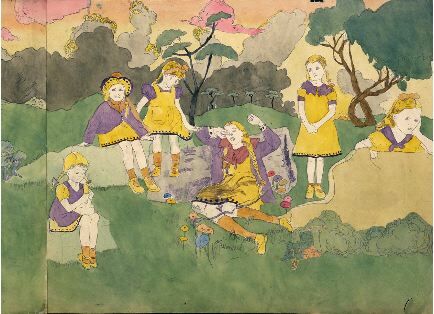 Henry Darger (1892-1973) is in many respects the prototypical "outsider" artist: a recluse who created a startling imaginary world in his rented room, unbeknownst to anyone but himself. Between approximately 1910 and 1921, Darger wrote what is believed to be the longest novel in existence, which he called The Story of the Vivian Girls in What is Known as the Realms of the Unreal or the Glandelinian War Storm or the Glandico-Abbiennian Wars, as Caused by the Child Slave Rebellion (for short, In the Realms of the Unreal). This 15,145-page saga documents a protracted war between an empire of evil, child-slave-owning "Glandelinians" and the "Christian nations," led by the angelic Vivian sisters. Upon concluding the novel, Darger devoted the remainder of his life to illustrating it, producing several hundred elongated watercolors that tell his story in a manner reminiscent of mural-sized comic strips. An obsessive-compulsive accumulator of news reports and popular illustration, the artist synthesized from these elements a complex pictorial narrative of suppressed sexuality, graphic violence and improbable idealism. Darger's artistic legacy, discovered shortly before his death by his landlord, Nathan Lerner, has gradually won a devoted following both within and beyond the field of "outsider" art. By inserting innocent-looking children (culled from coloring books, comic strips and fashion advertisements) into often grisly battle scenes and by equipping many of these children (regardless of gender) with penises, Darger created jarring juxtapositions that unwittingly expose the faux naiveté of mid-20th century American popular culture. This aspect of his work has struck a particularly responsive chord with contemporary audiences, accustomed as they are to such postmodern techniques as appropriation and recontextualization. Although some might be inclined to view Darger's work ironically, it is clear that the artist took his subject seriously. The war between the Abbiennians and the Glandelinians is nothing less than a global struggle between good and evil, reflecting on one level a battle being waged within Darger's soul, and on another mirroring the destructive course of modern history. It is the complex interplay between fantasy and reality in Darger's Realms that makes his opus so compelling.